The bride and groom wanted something a little different to the more traditional wedding cake, so we created this for them. 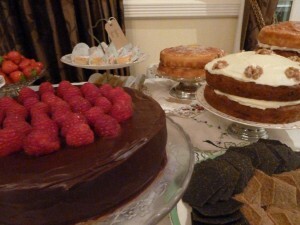 Our gorgeous cake stands piled high with lots of our yummy cakes. It looked divine and guests loved choosing their favourite vintage tea-plate and then filling it with their favourite cake. So if your stuck on which cake to go for then go for them all! Contact us to find out more. 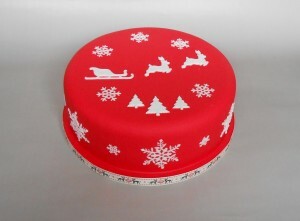 CHRISTMAS CAKES are ready to order! The summer feels like a distant memory, days are cold and nights are really really cold! 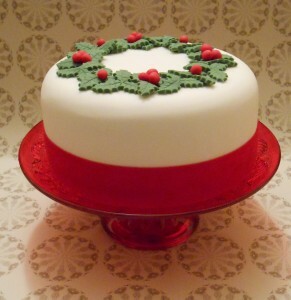 We thought it was time to take our vintage tea party hat off and set-to on this years Christmas cakes. What fun we have had! There is a design to suit everyone, and each design can be made in a range of sizes and therefore prices. To place your order just email us or call Alice on 07890 090547. 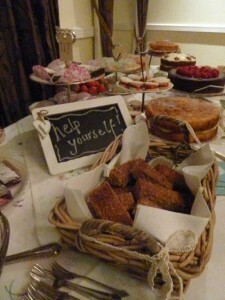 We’ve been busy bees for the last few months, lots of tea parties to bake for, china to shop for and weddings to plan. The last two days have been a little quieter so we have found time to try out a few recipes we have had our eye on for a while. 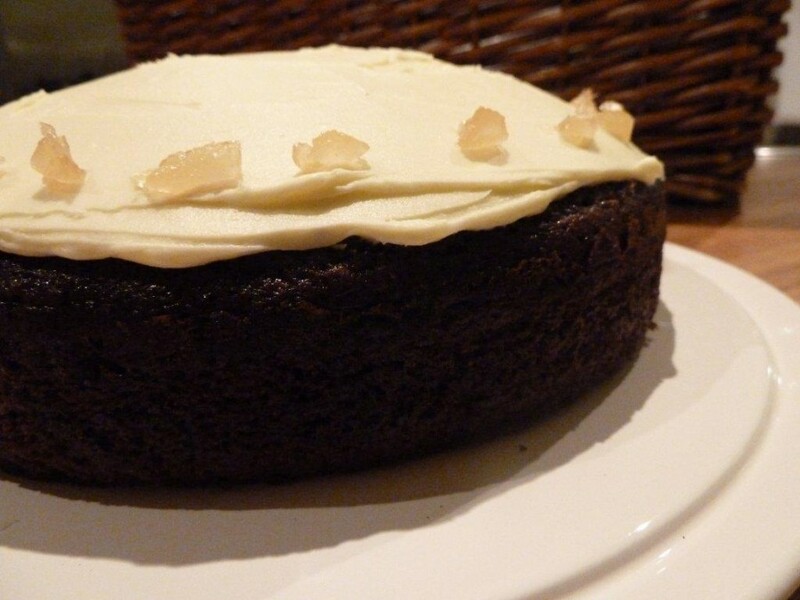 This one is our favourite…delicious and a great time of year to be baking with treacle and ginger. We found it in an old (ish) copy of the BBC Good Food Magazine and couldn’t resist sharing it. Hope you like it as much as we do. Heat the oven to 160c, gas mark 3. 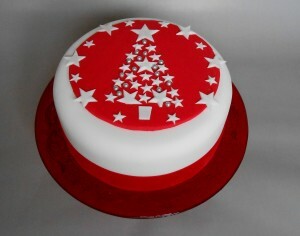 Butter and line a 23cm round cake tin. Put the butter, sugar, treacle and syrup in a large pan and gently heat, stirring until the butter has melted and the mixture is smooth. Remove from the heat and cool for 10 mins. Stir in the eggs and milk, then sift in the flour, ginger and bicarbonate of soda. Mix well then pour into the prepared tin. 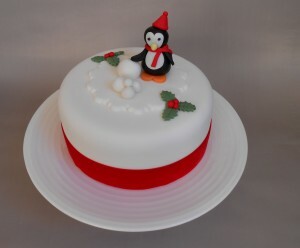 Bake for 50mins – 1hr until the cake is firm to the touch an springs back when pressed in the centre. Cool in the tin for 15 mins, then turn out on a wire rack to cool. Put the frosting ingredients in a small pan over a medium heat and stir until the butter has melted and the mixture is smooth. Increase the heat and boil hard for 3-4 mins, stirring occasionally, at this stage the frosting should look like runny custard. Pour into a bowl and leave to cool for 30 mins. Beat with an electric whisk until thick and spreadable. 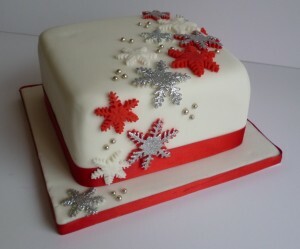 Spread over the cooled cake and decorate with crystallised ginger.